Meth is one of the most notorious drugs – frequently in the news, it destroys individual lives and communities due to its addictive properties. Meth has made the cover of major magazines like Time and Newsweek more than once. It is important for someone wanting to drug test for it to know exactly how long meth stays in the system. This is a largely misunderstood area, and a tricky question, because drugs can be detected in different parts of the body for different lengths of time. As our Drug Test Detection Times chart shows, the time meth is in your system varies. It varies, first of all, because our bodies vary – weight, metabolism, and overall health are just a few of the many factors that influence how long it takes the body to process drugs. But drugs pass out of commonly tested body fluids at different rates too. So, for example, 72 hours (3 days) is near the end of the time frame in which meth can be detected in saliva. It can be found as soon as 5-10 minutes after being used though. Meth can generally be detected in urine for 3-5 days skin care after use. 2-5 hours after use the urine drug test detection period begins. 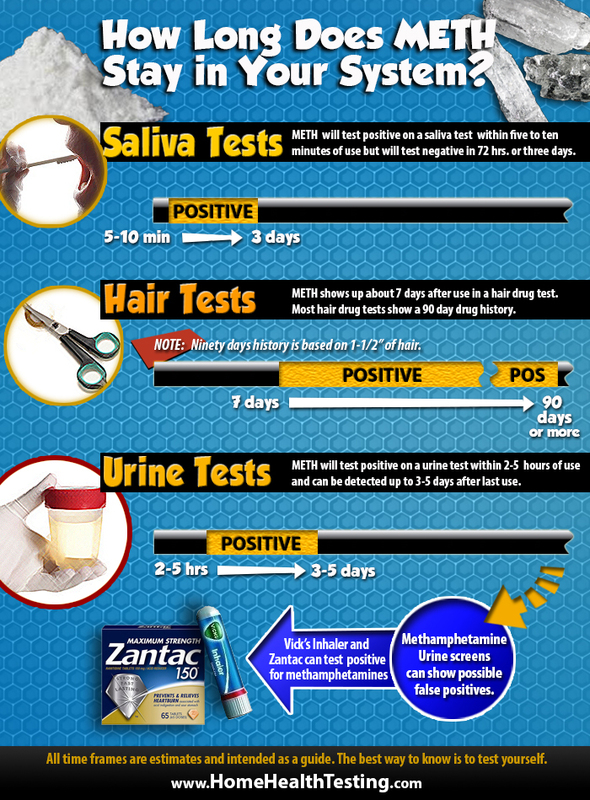 A urine Meth Test is extremely accurate (more than 99%) and FDA Approved as well. Meth stays in your hair, however, for 90 days and longer (90 days is just the industry standard for a consumer hair drug test – labs can actually go back longer than that). It takes about a week after use for the hair with meth traces in it to grow out of the scalp, but after that, a pair of scissors can clip the hair for a hair drug test and the meth will be found. For all of these tests, you do not have to be a chronic user to have your use detected. The body, and drug tests, are very sensitive and pick up even one-time use. Meth can stay in your system for a long time. This is just another reason to make sure that a drug as dangerous and harmful as meth stays out of your system. 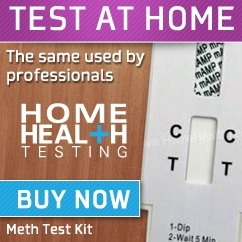 You can check out our urine Meth Test here. He has taken me back to court now 2 times in just over a year( his mommy is payng for all of this)He is living with his mother, again (he is 43 years old). In 2008 I took his “rights” away after he was arrested with 57 grams of meth in his car, under my daughter’s seat, while she was in the car with him. 57 grams is a lot from my understanding. He apparently has tested “positive” not once, but twice now since his 2008 arrest. In court, he stated that the 2 “failed” positive pee tests were cold medicine. The judge and the rest of the courtroom laughed-out loud. He has been to court to get his “differed adjudication” extended. Why would the courts do this? Why does his mother insist on bailing him out even when it is obvious that he is stil using? Not once, but twice he has tested “positive” for meth ( most recent, April of 2011). I do not beleive meth is in any cold medication?! This is apparently a very powerful drug, that not even a year in jail can cure. He is “back on the wagon” occasionally. Or he has just figured out what time and date he is to report, and has just slipped up a bit. IDK! I will not tolorate this. Meth is bad. He is still using, apparently. My daughter is with him for 5 days again–due to custody hearing recently. Why is he allowed to be so harmful to himself and to her?She is only 11 years old and mybe does not have a full grasp of what is transpiring? I do not want my daughter around that! How do I know, or the school nurse know, when he is on Meth? Hi Wendy, I believe that you can try a drug once and not become instantly addicted, however tolerance levels are different for every individual. He may well be using regularly, and id say that as he has been caught with 57 grams (In australia, if split up into point deals (small deals) and depending on quality, would be worth around $50,000, which is quite a lot as I’m sure you realise) he would have been using the drug to some extent. I cant say for sure obviously, but its unlikely, with such a large quantity, he’s not skimming a bit off the top for himself. It may explain his seemingly erratic behaviour? There are components required to make meth in some cold medicines I.e pseudoephedrine, but it is not at all likely that this is the cause of his positive drug tests. I had used meth and ice to some extent in my younger years, but did not feel that i was at all becoming addicted, even if i used 2 or 3 weekends in a row. I might just be lucky. I am now part of a police drug team designed to educate youths about the dangers of drug use and addiction, and let me tell you there are some kids younger than 11 that are very switched on to the behaviour of their parents and siblings. Don’t for a second be fooled into thinking that your daughter isn’t noticing some changes in her Father. It seems to me that eventually he will lose any contact time with your daughter, but who knows how the courts work sometimes. Wendy the reason your ex is saying that it is cold medicine is cause there are alot of medicines that when the body metabolises them it comes out as meth there are also some antibiotics that come out positive for meth especially when a lab does a drug test mainly because they are testing for the metabolites that a substance breaks down into. But you can only play that cold medicine card once! so if he is saying that its cold medicine again have him tested the next week! you will have to do some research on which cold medicines come up for meth in a drug test. I do know that theraflu will come up positive for opiates such as heroin. hope this helps! A friend that claims he doesnt use meth tested positive for its use. Is there anything other than meth use that that would cause a positive test? Hello, I have inhaled meth I don’t really remember when, maybe around the month of October or November, it was a small amount though. Will it still be in my body? I want to donate blood in my school do can someone answer me asap please, and thank you. You will know if he is on meth if he becomes jittery or he can not sit still, if he grinds his teeth or has meth bumps. And some cold medicine is used to make meth like cold medicines such as sudafed. I am a Court Appointed Special Advocate for children. How often is he ordered to take random drug tests? I would demand a hair one even if you have to pay for it to stop him from seeing your daughter if there is the slightest hint he is still using. You could also use this with the court as a leverage tool; he has to pay for and take the tests (preferably hair) every 90 days for a year or longer to show he is off drugs before visitation can ensue. If you could afford it, I would have a hair test done of your daughter to ensure that she has not been exposed to meth. If the result is positive, that alone could force the court to not allow visitation. Good luck. Hey Wendy, Im terribly sorry that you have been going through a rough time with your Ex and your situation with him and your daughter. Sores and scabs on the arms and or face from constant picking, tooth decay or loss, always on the go, can’t sit still, gets angry easy, hair loss and weight loss. This is personal but I don’t know if he smokes it, snorts it or injects it but you might find track marks if you looked on his arms unless he wears long sleeves which would be another sign he was hiding it. IF he snorted then he would be sniffing constantly whether he did any that day or not. If he smoked it his teeth would most likely be really bad at this point. Psuedaphedrine is a drug that used to be sold in gas stations for colds, sinus, and athsma but a little over a year ago was pulled off the shelf because people used it to make Meth. It has Amphetamine in it which would show up positive on a drug test for Meth Amphetamine but people use the excuse of taking that for colds all too often. When someone has had an addiction to Meth, their most likely still doing it when it shows up in a drug test, and props to Mr. Judge man for laughin at him! I don’t know your side of the story but I think its completely ridiculous that he would have any kind of custody rights to your daughter, again my heart goes out to you and im very sorry. I hope things work out for you and your child, good luck. Yahweh loves you, be blessed!! Jason had 9 months clean on the 4th of Feb. 2012. He has probation and has passed severval drug test in the past. He went Tues and failed a urine test for meth….how is this possible? How long can meth stay in your system? Is there anything that can cause this result other than the obvious explaination of actually using? The results are being sent off to the lab and we should have confirmation by Monday at the very latest. We are confused and concerned. Please pray for us! I believed for a 2 years my fiance wasnt using myth. He could sit and watch tv, play sports and function like a normal person.Something didnt seem right. I found drugs in his pocket 1/2 dozen times and he would deni, deni, deni that it wasnt his. I’m not stupid, its his. He lied about everything and it seemed so believable, I cant tell. After two months of him telling me he had a job and I knew he didnt…I got rid of him. Very confused…how can that be that he was so mello and function normal? I have been clean of methamphetamines since 2010. I used once in July 2011 and then December 2011 and then Feb 2012. Each time I only smoked a bowl. I am getting a hair test in a couple weeks. Will I test positive? I’ve read online its 90 days back, but I also read that to test positive the drug in question must’ve been used 3 times within the window of the test. Can anyone let me know. This is for my p.o. and yes I regret relapsing. Thank you. Has anyone tested negative after one time of using less than .3 g of meth in a 24 hour period snorting only not a user, test being done around 50 hours after last use, not flushing but drinking as much water as possible and coffee and redbull during the last hour waiting to go pee? Of course not the exact situation, I’m sure. But those w/experience, how will it most likely come out? Thin body type, high metabolism I think. My daughter had a urine screen taken because her mother in law wanted her child. she had a cold that week and had taken alka seltzer cold and sudafed medicine. To our horror and shock they said she tested positive for meth, we both kept insisting NO WAY. finally she said their test strips are really cheap and its posible that if she had a cold it could cause it to read positive for meth. They were taking her girls away, we said what to do, they said if within 24 hrs of that urine test she gets her blood drawn, she has to pay the cost, and gets it examined by a reputable lab through a clinic, dr whatever, if it comes back negative for meth within 24 hrs of the urine test saying positive, they will give her back her children. She went to the dr explained, gave blood, they sent it to a big lab in Memphis, TN, we r in Clarksville. Anyhow her blood came back negative for anything like that so next day she got her children back. How many false readings are done and they WONT give an inch and suggest a blood test could clear them. They let the whole cycle work the system, destroy families, because they are burned out from too many liars, druggies, you name it, so an innocent person protesting is met with distain. God help them, he did us. I have the same question as Kelly and Jason. Is there anything that can cause this result other than the obvious explaination of actually using? I want to be honest with myself and not give our granddaughter the benefit of unreasonable excuses. Someone please answer soon. well i hope everything works out for u!!! I know some one that use to use and they stopped clod turkey!! It really all depends on the person!!! Really to me its just the person thinking that they can’t stop!! And as far as your ex still being able to see your daughter, he shouldn’t be able to till he drops a clean UA!!! I think thats only fair!!! i would bring that up to the judge cause she coulkd be in danger!!! Then what will u do??? Good Luck!!! I have used a few times, and I totally disagree with one time is all it takes to become addicted! It’s a mental issue more so then anything else! You decide weather or not to use! Me, when I have done it, I have used then not for weeks, months, it’s not the drug! It’s the person abusing them!!! Addiction is all in your head. I would never blame the drug. The reason that many drugs are illegal is so that the doctors can perscribe their version of the drugs which is actually more unhealthy. The government wants you to die before you retire. for example Heroin is less harmful than oxycontin. I would never blame the drug, yes it has ruined many many lives and countless murders/crimes have taken place by drug users but when it comes down to it, its the person they make the choices , yea the drug can cause your judgement and conscience to be clouded. Alot of times people just enjoy the drugs too much or they are going through problems and prefer to do drugs and forget about the problems but you need to realise drugs are not as bad as you think.. its all about responsibility and being smart about it. Of course drugs are bad but guess what Too much of anything is bad. You can die from drinking too much water. I never blame the drug I do my research and I dont listen to what the government wants you to think. Study the drug find out all about it and say to yourself set a limit have fun but remember to put your life first don’t let the drug overtake you because the human mind is ever so powerful sometimes you just need some enlightenment. Dopemine and Dmt occurs naturally in your mine, Methamphetemines and DMT can be extracted from any plant you dont realise how natural it is. People like to say that when you do meth your doing draeno and chemicals from under your sink that is not true at all. You know how when you make hashoil out of pot and use Isoprofonyl and lighter fluid to extract it but in the final product your not smoking these chemicals? Thats what they do with meth they use chemicals to Extract the final product of pure amphetamines. I am sorry to hear your husband has been through some bad sometimes everybody goes through rough times they dont make the right choices just don’t blame the drug before you do your research.. and F all the proganda “faces of meth” all that is a lie. You know if you dont take care of yourself you can end up like that too without the drugs. This is just my opinion, I speak freely I respect peoples opinions and I like to talk about the issues without getting offended. I used to smoke pot frequently, but new management at my workplace has led to random drug tests. So now I smoke meth once a week on Friday evenings, party like a rockstar, then detox for 2 days so I can piss clean on Monday. Now I’m very athletic with an extremely high metabolism and I have a lot of knowledge of my own body. My advice to anyone trying to pass a panel test is to: Sweat alot, exercise, fast, take milk thistle and other detox supplements, drink plenty of water. Not in that order u will have to do your own research. Btw chronic use of meth is fkn stupid. It WILL destroy your life so if u have a weak mind this is not the drug for you. Thank God for reasonable and able minded people. PLEASE people, read JOSH and CHRIS’s posts, July 9th and 13th. Absolutely, Positively, spot on….! i did meth on friday i have a urine test on thursday will i be clean ? Meth should only stay in your urine for about 3-5 days, but every individual is different. Test yourself everyday for three days before your test to find out. Hello, my name is carolynn… My husband & I have been clean now for two… I purchased home drug tests to randomly test ourselves if we suspected one another was using… The other day on Tuesday I suspected my husband relapsed. He tested positive…it has now been 6 & a half days since he used the one time, he said he put it in a drink & drank it early in the morning… But he is still testing positive… Does this mean he used after that day… Because I know 3-5 days is the normal time it stays in your system, but 6-7 days later help me, I need to know so I can leave with my children because If he is back to using I fear for our safety, he is a violent user. The best advice is to take the urine sample to the lab and get a confirmation which will also tell you the level detected.